It has been a while since Joe put Perfect up on Kickstarter. The game didn’t reach the required number of preorders then, but he completed the game anyway and now it is up for sale. Perfect has been my most highly anticipated game for quite some time now, and it is with great joy I see that Joe has finally finished his project. I have already ordered the game and I can’t wait to start playing those 1984’esque stories in a Victorian’ish setting. 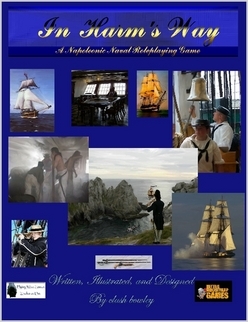 A few years ago I watched the Hornblower series on DVD. Neat stuff about a guy named Hornblower that rises through the ranks in the British navy during the Napoleonic wars. I asked around, looking for games to model that series, and In Harm’s Way by Clash Bowley was mentioned a few times. Then I watched the Sharpe DVD series, and realized that I wanted my games to take place on land, and for that I already had Höstdimma. But still, In Harm’s Way had raised my interest, and when I did a Lulu order right before Christmas I put it in the basket. Lulu took their time printing and shipping, so I didn’t get the game until after Christmas, but now I have read it and thought I’d share my opinions on the game. In Harm’s Way is 132 pages in US letter format. There are a few photo manipulations showing ships and men in period uniforms and sketches illustrating the layout of the insides of the ships. The layout is simple and usually in a two column format, and large enough to be a nice read, and sometimes in single column with very long lines, not so fun to read. The game follows the old school of organization for the material (put stuff in the game in the order it was written), but there are both a table of contents and a register to ease finding specific information. In Harm’s Way is designed to emulate the feel of the historical naval adventures of Forester, O’Brian, Parkinson, Lambdin, Pope, and many others rather than the actual history. As such, it’s heavy on the adventure and romance, and light on the blockade and convoy duty. The reader is expected to be familiar with the genre, but there are statistics for various kinds of vessels if a refresher is needed on the difference between a yawl and a launch. There is a strong focus on doing stuff on a ship, mostly combat, as could be expected. In Harm’s Way uses a modified StarCluster 2.5 system (Clash has written lots of games, those that fancy the system have games for a life time available.). I haven’t read any other games that use this system so I can’t tell which is standard and what has been modified, but at it’s core it is a BRP derivate. Roll a d100 under skill+modifier to succeed. There are a few neat mechanisms in the rules that I have not seen before. Initiative is rolled with a d100, lowest acts first, but players can chose to adjust their initiative after rolling in exchange for bonuses or penalties to the following attack or damage roll. The PCs track their Practicality and Honor scores, both start at ten, but they will fluctuate during play. The sum of them is always 20, as soon as one is increased the other must be decreased. Practicality and Honor can be added as a bonus on rolls that have to do with how practical or honorable the PC is. The PCs have a stat called Luck, that is used like Fate in Höstdimma. Spend a point, say the key phrase and take over the narrative privileges from the GM for a short time. Not new to me as such, but it was fun to see that someone else had used the same idea in almost the same way. The form is traditional with GM and players, but with the troupe play twist. Each player can have multiple characters, their officer is the main, but they can also play a seaman and a warrant officer on the side. Useful if the party splits up to do different things at the same time. Players compete against each other for Notice, who is the bravest or most capable officer? The winner will get promoted, leaving his old friends behind. The setting is weak, but that should not be a problem if everyone is familiar with the genre. The rules are good, but they only cover a narrow field of naval combat and competition between officers. Players that are looking for the romance mentioned on the back of the cover will have to play those parts without support from the rules. The form is weak, if you already know how to play role playing games this is not a problem, you can take what is given and apply it to your own style. Little advice is given to the new GM on how to write adventures and run the game, or to the experienced GM on how to get the feel of the source material in the game. Last weekend I hosted a potluck RPG convention together with a friend. The guests were invited to facilitate/GM whatever games they wanted during a whole weekend of gaming. In the end there were so many of us that we needed two apartments, and people drifted back and forth in -20C / -4F going between games. I played Montsegur 1244, Holmes D&D, Polaris and… well we were supposed to play Atomic Highway on Sunday morning, but the GM had caught a bad cold and had to cancel. So there I was with three other players, nothing prepared and four hours to spend. The others had their minds set on Sci Fi and some sort of apocalypse. What to do? 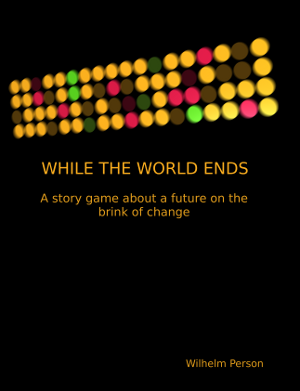 I brought out While the World Ends, a story game written to match those exact criteria, did a short intro and we started with the world building. Together we built a rather bright and shiny Sci Fi setting. The main idea was fusion power, providing everyone with cheap and reliable energy. This allowed greenhouses even in arctic regions, and the population was spread out in small communes all over the planet, leading some sort of nice futuristic hippie lives with robot servants. The power was held by the electrical company, that over the centuries had formed something like a monarchy governing the whole planet, with a baron or count in every commune. Also this planet was under threat of the nearby star going supernova, but thanks to the centralized power structure everyone on planet had focused their efforts towards the building of generational star ships. + Either the star ships would prove to be a great success, and the people would spread out over the galaxy. – Or internal struggles among the nobles of the power company would lead to civil war and the abandonment of the star ship project. We added some initial relationships between the characters and the story was ready to start. Everything started with Ottilia getting a strange form letter from the Baron’s office, she was being reassigned to work in the cobalt mines, and through the entire story the fought an ever increasing pile of paperwork trying to stop the bureaucracy. Also we learned that she was dating Oskar, and enlisted his uncle Albert in the fight against the uninterested clerk Chekov. Oskar had his robot lie to him about hacking into the exchange office mainframe, and was under investigation for the hacking. He geeked out about sentient machines with his friend Hans. He also managed to convince uncle Albert to give The Bumblebee official access to the exchange office records. Chekov schemed with Anton in a double coup, both to replace Elin with Anton as commander of the Pico, and to discredit the ruling baron for incompetence. The plan almost succeeded, but was foiled at the last minute by The Bumblebee, when the tampering with Elin’s records was discovered. Captain Elin found out that Anton was scheming for her place as the commanding officer of the Pico. Together with her husband Albert she managed to restore her good name. Ottilia and Elin won the game when Ottilia managed to win the battle against Chekov’s bureaucracy. Epic, right? In the epilogue we saw Chekov serve a long prison sentence, and then rejoining the bureaucracy at the very lowest level of paper pushing. Oskar managed to get The Bumblebee assigned as permanent captain of the Pico, an immortal robot to keep watch over the humans on their long voyage through space. Captain Elin gave up her place to the robot and found a peaceful life working in the ship’s greenhouses with her husband. And the final epilogue was set ten years later, and showed a girl with bangs giving her mother Ottilia a hug before being sent to her father Oskar for lunch, all in a greenhouse under a starry space sky. A happy ending for a good session and a good story. I especially liked the happy part of the end, after a weekend of Montsegur 1244 and Polaris you need all the happy you can get. www.lulu.com/product/paperback/while-the-world-ends/13659977 – Buy While the World Ends through Lulu. First! Drop everything and go and read Call for Papers: “Magic Missile” for GPNW 2011. See the cover of that book? Neat, eh? I understand that the cover is just a preliminary mock up, but still, awesome owlbear. I submitted a proposal for an article, will you? Also, I am a great fan of RPG Podcasts, and I usually point out the nuggets of gold I find on NordNordOst, but they are all English language. At least they have been until now. Thom Kiraly has started Märklighetstroget, the first Swedish RPG podcast. The first episode is about Play Unsafe. Now that I am breaking my review streak to post about random stuff anyway, go check out the discussion about Game mashups. Some of those imagined games should be put to paper, and then brought to my gaming table. Montsegur 1244 has been sitting on my shelf for a while. I bought it when it was all the rage, and then saw that you had to ‘assemble’ the game, build cards and stuff. I had other games that had a lower threshold for getting started so it was sort of forgotten about. 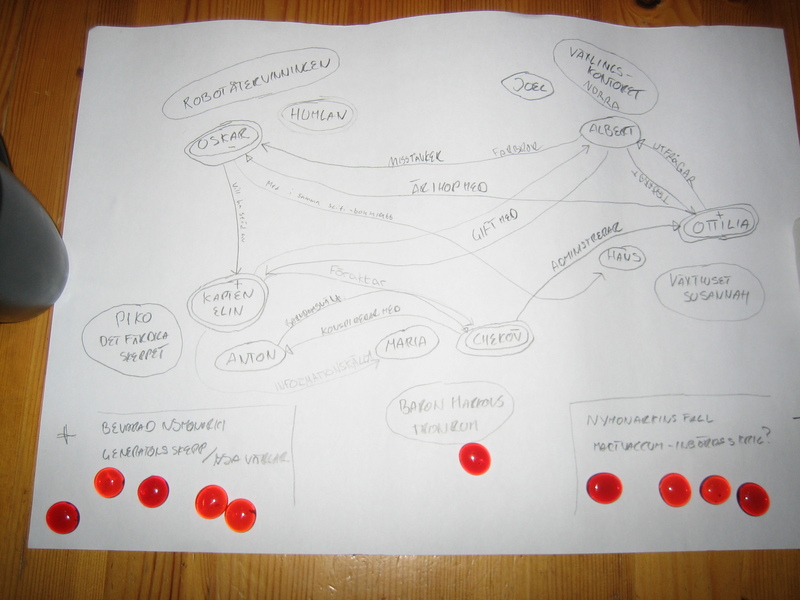 Anders and I are discussing which games to bring to conventions under 2011 under the Nordnordost umbrella, and next weekend we’ll have a minicon to test games to see what they’re like in actual play. Montsegur 1244 has been scheduled, so it is time to read up on it. 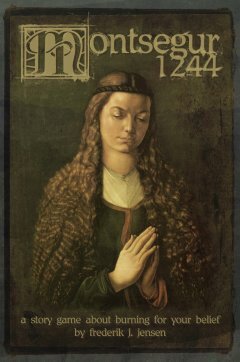 What you get when you buy Montsegur 1244 is a 64 page book, that book sort of contains the game. And sort of it does not, you have to go online and get various cards and a board, print and assemble them. Most of the material is included in the book, if the Montsegur 1244 site goes the way of the dodo, you could piece the a set together by what’s in the book. You can’t just cut the pieces out of the book (heretic! ), even if you want, due to the way the cards are taking up both sides of page. Most of the 64 pages are cards and other stuff needed to play the game, the game text is short, laid out to be easy to read, but I had to read through the book a few times to get the hang of it. There are illustrations by both the author and Brian Rasmussen. The year is 1244 and in the fortress Montsegur in southern France a group of Cathars are under siege. The game will end with defeat and the defeated will have to renounce their faith or burn at the stake, the question is why do they chose one or the other? The game is about answering that question. A brief introduction to the Cathar faith and the Albigenesian crusade is provided in the game text. There are rules to govern the distribution of narration privileges and not much more. The 12 pregen characters are distributed among the players, who then take turns setting scenes in a prologue, four acts and an epilogue. The scenes are based on randomly drawn cards, thus the order of the cards will change between games and add replay value. The players also have cards to interrupt the narration privileges from a player and take over. In the epilogue the players themselves decide what happens to their characters, with the limitations that at least one character must burn on the stake, and at most one character can escape. Remaining characters renounce their faith. Not much to add besides what was said in the rules. No GM, the players take turns setting scenes. Everyone plays at least two characters, keeping one as their main, and the other(s) as a sort of NPC. There are short sections with advice on coming up with scenes, and how to set them. The setting is weak. There might be enough for play in the book, but I found it lacking and went online to read up on the Cathars and the crusade against them. What I read made the game seem more interesting, however if all that information were to be included in the game the amount of information needed to be conveyed to the other players by the facilitator would go up. I guess there is some sort of balance to be found here. The rules are ok. No conflict resolution, no dice, no nothing. The game is all about playing the characters and narrating the events around them, and the rules for that are clearly explained. The form is good. It is clearly explained how to play the game, and how to move the narration privileges around the table through the use of the cards. Yes, next weekend. Would I have if I hadn’t read about the Cathars? And had pressure on me to actually assemble the game? I doubt it. I get a feeling that there is a strong element of emergent play here, that I fail to see when just reading the game. I hope I’ll find reason to get back to this game with a ‘Playing Montsegur 1244’ post. thoughtfulgames.com/montsegur1244 – Official Montsegur 1244 page at Thoughtful games. This is where you can download the stuff needed to play the game.